Nothing makes me more happy than very little wash-up after cooking a meal! 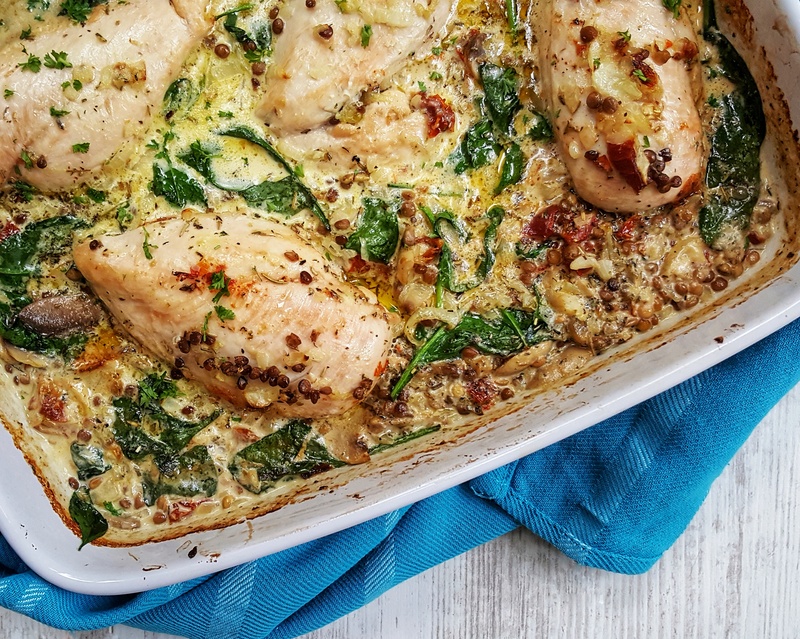 This Creamy Mushroom, Spinach & Lentil Chicken Bake only uses one frying pan and one dish to cook and serve the entire recipe from – an absolute win in my book!! A few weeks back I went foraging for wild mushrooms at home in the fields and suddenly I had a ton of mushrooms to use up. A favourite dish of my Mam’s is her Creamy Beef & Mushroom recipe which was the inspiration for this dish. I have added a few more additions like spinach, sundried tomatoes, lentils and I’ve used chicken instead of beef but the recipe will work perfectly with just mushrooms, onions and beef too. Tinned lentils and beans are my definition of fast or convenience real food. I regularly use the dried variety too but when you want real food fast, the pre-cooked tinned option is your best friend. This entire dish will take about 30 minutes to cook with 10 minutes to prep. Plan ahead and prep the onions, garlic and mushrooms the night before or simply cook the entire dish in advance, cool, refrigerate and reheat when you want to serve. Preheat an oven to 200°C/180°C fan/400°F. Spread the lentils on the base of a large ovenproof dish. Heat 1 teaspoon of the oil in a large frying pan over a medium heat. Brown the chicken on all sides and transfer to the ovenproof dish with the lentils. Heat the remaining oil in the frying pan. Add the garlic and onion and cook until the onions have softened. Pour in the cream or creme fraiche mix and crumble in the stock. Increase the temperature of the pan until the cream begins to bubble. Stir in the mixed herbs and sundried tomatoes until fully combined. Pour the contents of the frying pan over the chicken and lentils. Place the ovenproof dish in the pre-heated oven and cook for 15-20 minutes until the chicken is fully cooked through. Stir through the spinach just before serving. Serve with more steamed greens on the side or simply as is.